How does lead pricing work? During beta, pricing is at low flat fixed fee of $50/lead and adjusts up or down $10 based on portfolio size. This article outlines how initial lead pricing was created, the rationale behind it and most importantly--how you can think about (and calculate) the value of qualified leads for your company. How do I know how much a qualified lead is worth to my business? In the hotel tech industry where continuously acquiring new customers is extremely challenging, complex, unpredictable and often expensive--our goal is to become a reliable stream of low cost and high quality leads to help our community of vendors grow their businesses. We surveyed several hotel tech companies and found that most vendors don't have a clear picture of their acquisition costs in many cases and thus we wanted to make pricing simple and easy to understand, hence flat low pricing. But all categories are different, so why is pricing the same across all? Again, the answer is simplicity. Beta pricing was created with the lowest cost vendor in mind so that leads are accessible and affordable for everyone on the platform. We believe that whether the product is $100/month or $1,000/month this pricing makes everyone happy (certainly some happier than others). 2. How can I think about how much qualified leads are worth to my business? Before we begin, keep in mind that most vendors on HTR have an average deal size of at least 3x, so needless to say this so this is VERY conservative. Nonetheless, let's use this example to see how lead value pencils out even on such small deals. First we have to where traffic (CPC) can be acquired online today. Let's use "hotel revenue management software" as our benchmark which on Google, costs ~$16/click (remember, this is just a click, not a conversion/lead). Then we have to look at your company's website conversion rate to back into an approximate CPA (cost per action). Let's be conservative again and assume you have a high conversion rate of 10% (aka. 1/10 site visitors converts to a demo) on your website. So at $16/click and 1/10 visitors converting, your cost-per-demo on your brand.com website is $16/click * 10 clicks/demo = $160/demo booked. Now in reality the above scenario is quite conservative because lifetime value of each customer is not taken into account. Let's use the same example of a $100/mo website widget and let's say the average lifetime of a customer is 3 years. First we have to identify customer lifetime value. In this example, with an average deal size of $100/mo (or $1,200/year) and average lifetime of 3 years, your LTV is $3,600/customer. To be conservative again, we discount that amount to present value which comes out to around $3,000/customer. Next we factor in our lead-to-close rate to determine the value of a qualified inbound lead. From the time your company gets a qualified lead, what percentage of them on average do you convert to a customer? If you don't know your lead to close rate, you can ask your sales team but let's take a conservatively low close rate of 15% (most vendors on HTR are closer to 25-30%). Your company likely has a much higher deal size than $100/mo but in this example you can see that even if your average deal size is only $100/mo, $50 per qualified demo is an extremely well priced lead well worth the investment whether you take a bottom up approach and get to a value of $160/lead or a top down approach and get to a value of $450/lead. We priced leads at a flat low price of $50 in the hopes that a qualified demo should have a theoretical value even to the lowest cost vendors on HTR of of $160-$450/lead per the example and thus be a "no brainer" in terms of value. 4. 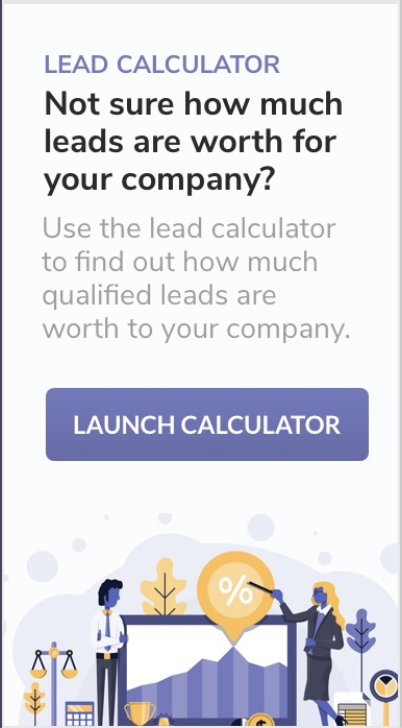 Want to try the lead value calculator? 5. Have any comments or suggestions? We'd love to hear from you! If you see ways we can improve our pricing or make it more dynamic for your categories, we would love to collaborate with you to determine what pricing you believe is fair and accurate in the long term so make sure you continue to receive high quality leads at a fair price. Feel free to write in via our 24/7 live chat with suggestions or to schedule a call with one of HTR's founders.